Taste-tempting cake balls adorned with an eye-catching array of bright and colorful Easter eggs. 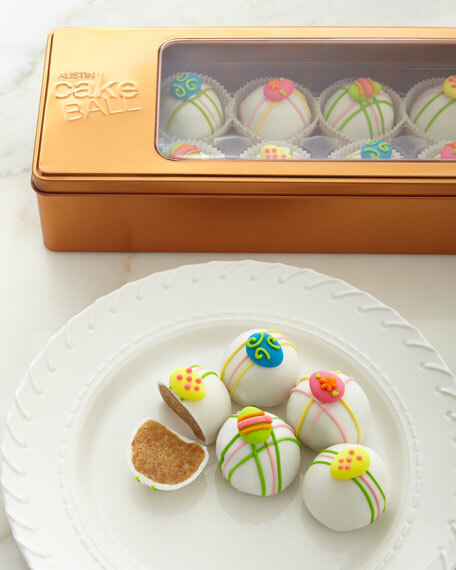 12 hand-decorated cake balls in a giftable tin. Includes six Chocolate cake balls flavored with a subtle blend of espresso and coffee extracts and six Salted Caramel cake balls with golden fleur de sel vanilla bean caramel and salted caramel buttercream. Tin measures 11.75"L x 4.75"W x 2.25"T.
Allergen Information: Contains wheat and dairy. May contain traces of peanuts and/or tree nuts. For in-store inquiries, use sku #1760956.